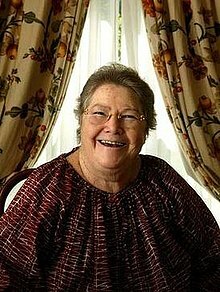 Colleen Margaretta McCullough AO (/məˈkʌlə/; married name Robinson, previously Ion-Robinson; 1 June 1937 – 29 January 2015) was an Australian author known for her novels, her most well-known being The Thorn Birds and The Ladies of Missalonghi, the latter of which was involved in a plagiarism controversy. McCullough was born in 1937 in Wellington, in the Central West region of New South Wales, to James and Laurie McCullough. Her father was of Irish descent and her mother was a New Zealander of part-Māori descent. During her childhood, the family moved around a great deal and she was also "a voracious reader". Her family eventually settled in Sydney where she attended Holy Cross College, Woollahra, having a strong interest in both science and the humanities. She had a younger brother, Carl, who drowned off the coast of Crete when he was 25 while trying to rescue tourists in difficulty. She based a character in The Thorn Birds on him, and also wrote about him in Life Without the Boring Bits. Before her tertiary education, McCullough earned a living as a teacher, librarian and journalist. In her first year of medical studies at the University of Sydney she suffered dermatitis from surgical soap and was told to abandon her dreams of becoming a medical doctor. Instead, she switched to neuroscience and worked at Royal North Shore Hospital in Sydney. In 1963, McCullough moved for four years to the United Kingdom; at the Great Ormond Street Hospital in London she met the chairman of the neurology department at Yale University who offered her a research associate job at Yale. She spent 10 years (April 1967 to 1976) researching and teaching in the Department of Neurology at the Yale Medical School in New Haven, Connecticut, United States. While at Yale she wrote her first two books. One of these, The Thorn Birds, became an international best seller and one of the best selling books in history, with sales of over 30 million copies worldwide, that in 1983 inspired one of the most-watched television miniseries of all time. The success of these books enabled her to give up her medical-scientific career and to try to "live on [her] own terms." In the late 1970s, after stints in London and Connecticut, she settled on the isolation of Norfolk Island, off the coast of mainland Australia, where she met her husband, Ric Robinson. They married in April 1984. Under his birth name Cedric Newton Ion-Robinson, he was a member of the Norfolk Legislative Assembly. He changed his name formally to Ric Newton Ion Robinson in 2002. McCullough's 2008 novel, The Independence of Miss Mary Bennet engendered controversy with her reworking of characters from Jane Austen's Pride and Prejudice. Susannah Fullerton, the president of the Jane Austen Society of Australia, said she "shuddered" while reading the novel, as she felt that Elizabeth Bennet was rewritten as weak, and Mr. Darcy as savage. Fullerton said: "[Elizabeth] is one of the strongest, liveliest heroines in literature … [and] Darcy's generosity of spirit and nobility of character make her fall in love with him – why should those essential traits in both of them change in 20 years?" McCullough died on 29 January 2015, at the age of 77, in the Norfolk Island Hospital from apparent renal failure after suffering from a series of small strokes. She had suffered from failing eyesight due to hemorrhagic macular degeneration, osteoporosis, trigeminal neuralgia, diabetes and uterine cancer, and was confined to a wheelchair. She was buried in a traditional Norfolk Island funeral ceremony at the Emily Bay cemetery on the island. In 1984, a portrait of McCullough, painted by Wesley Walters, was a finalist in the Archibald Prize. The prize is awarded for the "best portrait painting preferentially of some man or woman distinguished in Art, Letters, Science or Politics". The depth of historical research for the novels on ancient Rome led to her being awarded a Doctor of Letters degree by Macquarie University in 1993. She was appointed an Officer of the Order of Australia on 12 June 2006, "[f]or service to the arts as an author and to the community through roles supporting national and international educational programs, medico-scientific disciplines and charitable organisations and causes". McCullough also published five murder mysteries in the Carmine Delmonico series. The Thorn Birds: The Missing Years – made into a TV miniseries in 1996 starring Richard Chamberlain. It covers a 14-year period from the novel which was omitted from the first production. ^ a b Susan Wyndham (29 January 2015). "Colleen McCullough, author of The Thorn Birds, dies". The Age. ^ "About Colleen McCullough", fantasticfiction.co.uk; retrieved 3 January 2016. ^ a b Cheetham, Anthony (30 January 2015). "Colleen McCullough obituary". The Guardian. Retrieved 30 January 2015. ^ "Colleen McCullough: Internationally acclaimed Australian Thorn Birds author dies aged 77". ABC News. 29 January 2015. Retrieved 1 February 2015. ^ Jason Steger, "McCullough cut through the small talk". Profile, Sydney Morning Herald, 31 January 2015; retrieved 2 February 2015. ^ a b c d e f Fox, Margalit (29 January 2015). "Colleen McCullough, Author of The Thorn Birds, Dies at 77". The New York Times. Retrieved 29 January 2015. ^ Mary Jean DeMarr, Colleen McCullough: a critical companion, p. 3. ^ The Independence of Miss Mary Bennet, stevedow.com.au; accessed 3 January 2016. ^ "Colleen McCullough to be buried among Bounty mutineers". The Sydney Morning Herald. Retrieved 3 January 2016. ^ "Archibald Prize 07". Art Gallery NSW. Retrieved 19 July 2007. ^ McCullough awarded Doctor of Letters, abc.net.au; accessed 3 January 2016. ^ McCullough profile, itsanhonour.gov.au; retrieved 2 February 2015. ^ a b c Michelle Smith, "Was Colleen McCullough under-regarded as a writer? The next few chapters will tell", TheConversation.com; 29 January 2015. ^ Patricia Maunder. "Outspoken writer Colleen McCullough praised by all except literary establishment", smh.com.au, 30 January 2015.